The story of Chanukah, also known as the Festival of Lights, begins over 2,000 years ago, when the Jews were persecuted by the Seleucid ruler, Antiochus Epiphanes. Outlawing Judaism, the tyrant ruler desecrated the Second Temple of Jerusalem, and demanded that the Jews either worship Greek gods or be put to death. A resistance movement was later led by the Maccabees, who finally defeated Antiochus and won back the Temple. Since then, Jews have commemorated this event by lighting Hanukkah candles. When & How Was the First Chanukah Celebrated? Chanukah closely resembles the dancing festival of Sukkot, a joyful celebration lasting for eight days, and which commemorated the day the Jews finally ended their desert wandering and built the First Temple. As a Temple holiday, however, the Jews were unable to properly celebrate it for as long as their religion was banned in Jerusalem. Most likely, the very first Chanukah was the first time the Jews could celebrate Sukkot after re-claiming the Second Temple. When Did Chanukah Start to Resemble Its Current Form? The menorah candle tradition likely originated in the 19th century, when the Jewish holiday became increasingly popular, and finally made its way to New York and the rest of North America around the 1920s. The tradition in its current form requires 44 menorah candles – enough for all candles (including the shamash candle) to be burned all the way through each night, starting with two (the first Chanukah candle and the shamash), then three, then four, and so on. 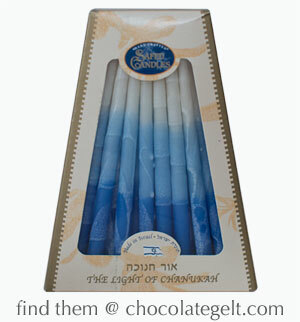 If you are still looking for Chanukah candles, you will find them here: Chocolategelt.com. Made in Israel and they burn beautifully.